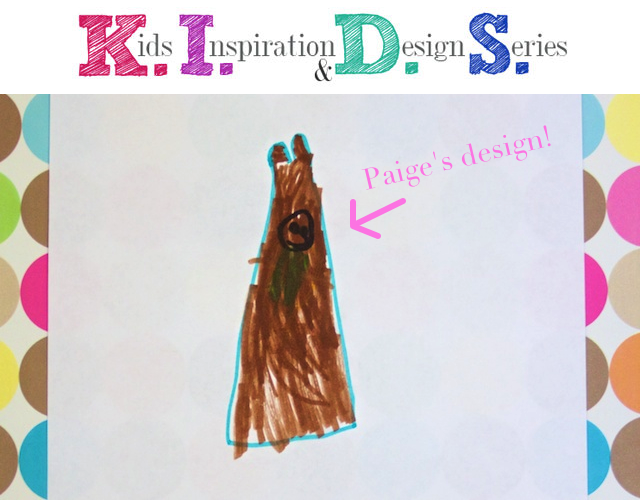 Guest Post and Interpreting Paige's Design! Today I am honored to be guest posting for Jessica at Me Sew Crazy! She had the brilliant idea to ask some bloggers who have children to create an outfit that their child designed. How adorable is that! It has been an absolute blast to see what the kids have drawn and what their mom's have made. And today is my (and Paige's) turn! Her dress was...somewhat different than I imagined it would be...but we had fun making something pretty from it! Go check out what we made!! thank you again so much Disney for being a part of the Series! I am in love with your creation, and Paige's design? Awesome. HA! I love it! Thank you again! The two of you together make a great design team! Disney, that dress was awesome. Is that Paige's room with the striped (wallpaper?) walls and the polka-dot floor, or somewhere else??? It's ADORABLE - I want that wallpaper in my room!! I wish my house was that cute! But it's just a set up I made in my studio using wallpaper and floorboard trim from the hardware store. Your post totally cracked me up. I wasn't sure if you were going to go all linen - japanese pattern book esque, or what. but i LOVE your interpretation. so cute!! It was really hard to think of something that she'd actually wear! But she really liked this one. Phew! Awesome job on both your parts-I have budding artists and totally relate. Loved the fabrics, details & lil' model. How cute! Can't wait to read! I had so much fun looking at the design by Paige and what you both ended up with. Great job to both mother and daughter.